Chuck Van Horn is a shareholder at Berman Fink Van Horn where his practice involves business and commercial litigation with an emphasis in litigation arising out of real estate transactions. Chuck represents financial institutions, mortgage companies, loan default services, title companies, attorneys, real estate brokers, appraisers and builders and developers in all types of disputes, including loan enforcement, data breach and cyber-related issues, foreclosure claims and related litigation, title litigation, contract disputes, business torts, unfair competition claims, malpractice allegations and partnership, shareholder and other internal corporate disputes, particularly those arising out of real estate enterprises. Chuck handles a significant number of cases involving fraudulent transfer claims and has tried such claims to jury verdict. Chuck’s representation of builders, developers and contractors includes representation of both plaintiffs and defendants in disputes involving construction defects, title issues and disputes involving tortious interference with business and contractual relations, breach of fiduciary duty and/or duty of loyalty and unfair and deceptive trade practices. Chuck’s representation of real estate professionals includes professional malpractice actions against real estate brokers, appraisers, attorneys, title abstract companies and other licensed professionals. This portion of Chuck’s practice also includes handling claims for unpaid real estate commissions, and representing real estate professionals before administrative agencies such as the Georgia Real Estate Commission and local Boards of Realtors. Chuck lectures frequently on trends in the real estate industry, including conducting numerous seminars on lender litigation matters, foreclosure issues and fraudulent conveyance claims. In addition, Chuck has spoken to real estate brokers and other professionals providing practical tips on malpractice prevention and other emerging issues in the real estate industry. Chuck has also conducted seminars on how to identify mortgage fraud. 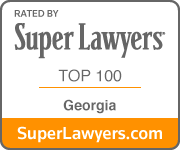 Named a Top 100 Georgia Super Lawyer since 2013, as well as Super Lawyer 2006, 2009 – present, Chuck has taught as an adjunct professor at Emory University School of Law. He served as the Chair of the Real Estate Section of the Atlanta Bar Association, as well as Secretary and Treasurer of that Section. In addition, he has served as a member of the Board of Directors of the Litigation Section of the Atlanta Bar. Chuck is the Alumni Recruitment Network Coordinator for Georgia on behalf of his alma mater, Villanova University. After graduating from Villanova University, Chuck obtained his law degree from The Emory University School of Law. Living in Atlanta since 1991, he is married to Christy Van Horn and has three daughters. A track and cross-country runner in college, Chuck continues to support the sport as co-founder of the DeKalb Trailblazers, a youth running club designed to encourage members to enjoy the sport of cross-country. In his spare time, Chuck coaches cross-country and basketball and remains an active runner and avid baseball fan. Topic: "Data Protection: What all Business Owners Need to Know"(4/29/16 Berman Fink Van Horn Breakfast Briefing) Guest Speaker: Neil Singer, Chief Information Officer at Billtrust CLICK HERE for the whitepaper, "The Top Ten Cyber Risks Facing Small and Medium-Sized Businesses (SMBs)"
Calling all Creditors: Help is on the Way! Garnish at your own Risk! We successfully defended a financial institution against claims for wrongful foreclosure. At center stage was Berman Fink Van Horn’s demonstration that our client did not deviate from its loan documents. As such, the Court determined the foreclosure was proper and refused to set aside the foreclosure. – Executive Committee Member for group that saved 22 acre in-town tract from development. Responsible to management of land as green space. In January 2019, Chuck co-presented to Fulton County State and Superior Court Judges and Staff Attorneys on voidable/fraudulent transfers. This presentation was part of a seminar/CLE series hosted by the Fulton County Business Court. In October 2018, Chuck presented at a National Business Institute (NBI) video webcast, “Civil Trial Made Simple.” He discussed the elements of successful opening statements, direct examination essentials and basic cross-examinations tools. In October 2017, Chuck presented at a National Business Institute (NBI) video webcast, “Key Cross-Examination Tactics Every Lawyer Must Know.” Chuck discussed rules, research and preparing for the cross-exam. In April 2017, Chuck participated in a National Business Institute (NBI) seminar, “The Rules of Evidence: A Practical Toolkit (A real-world application of evidence to courtroom events).” Chuck addressed how to keep evidence out (pre and post trial) and the admission/exclusion of unique evidence. In November 2016, Chuck spoke about “Fraudulent Conveyances” at a statewide seminar organized by the Real Property Section of the Georgia Bar Association. In August 2015, Chuck presented “Turning Bad Debt Into Meaningful Recovery” at the Community Bankers Association of Georgia headquarters in Atlanta. In January 2015, Chuck presented “Real Estate Litigation: The Dirt on Litigating a Real Estate Claim” to members of the Atlanta Bar Association. In December 2014, Chuck presented “Real Estate Litigation in Georgia” to attendees at the National Business Institute. In February 2014, Chuck was a featured speaker on the use of receiverships in litigation. In November 2013, Chuck spoke on effective closing argument strategies in jury trials for presentation by the ACYL. In November 2013, Chuck was a featured panelist at the State Bar of Georgia “Real Property Foreclosure” seminar. In 2012, Chuck spoke on the effective use of mediation strategy in real estate disputes for a presentation by the Atlanta Bar Association. On September 1, 2011, Chuck presented “Catch Me If You Can,” a seminar on fraudulent conveyance actions, before the Atlanta Bar Real Estate Section. On March 3, 2011, Chuck spoke on Foreclosure Litigation and Confirmation Hearings before the Atlanta Bar Real Estate Section. Since 2009, Chuck has served on the faculty of Real Property Foreclosures, a seminar sponsored by I.C.L.E. and organized by the Georgia State Bar Real Property Section. Obtained summary judgment in fraudulent conveyance lawsuit and successfully set aside transfer of luxury home, luxury car and money transfers. Litigated breach of office lease at headquarters for financial institution against landlord. Counsel on behalf of financial institutions and its trade associations in data breach class actions against Home Depot (filed in Georgia), Wendy’s (filed in Pennsylvania) and Noodles (filed in Colordado). Successfully litigated claims on behalf of credit union against national banks over breach of provisions under UCC. Through resolution, all funds lost by credit union were recovered. Successfully resolved claims of departing shareholder from Atlanta-based law firm. Successfully litigated claims on behalf of distributor against importer of custom wheels for defective merchandise. Distributor recovered all sums owed against importer. Successfully litigated claims on behalf of developer of mixed use project relating to management fees, property rights and easement rights in large in-town project. Obtained judgment for $2,850,000 after week-long jury trial for lender in case against borrower and related businesses. Trial court award of commissions to commercial real estate broker affirmed on appeal. Obtained six figure settlement in fraudulent conveyance action in action to set aside multiple transfers of real estate, luxury cars, and other assets. Successfully defended law firm and title agency in claims by national lender for misconduct. In March 2011, successfully defended developer in foreclosure confirmation hearing against national lender, defeating claims of several hundred thousand dollars. Obtained dismissal on statute of limitations grounds of premises liability claims arising from shooting at a hotel. Obtained favorable settlement of federal lawsuit alleging Fair Housing Act discrimination against extended-stay hotel. Obtained dismissal on jurisdictional grounds of federal copyright infringement action brought by copyright troll against website owner who was alleged to have improperly replicated a news-related image from the Denver Post’s website. In January 2010, obtained $1,000,000 settlement for family in wrongful death action against trucking company. In January 2010, obtained jury verdict of $480,000, including punitive damages, in claims for fraud in real estate investment. In November 2009, obtained jury verdict in excess of $550,000 in fraudulent conveyance lawsuit against son, father and companies they controlled. Successfully defended claims against real estate broker and developer brought by potential buyer of land; later defended all decisions on appeal. Obtained six figure settlement in arbitration against builder for construction defects. Obtained dismissal for national default servicer in lawsuit challenging legality of foreclosure. In December 2008, obtained jury verdict of over $1,000,000 for developer against general contractor and others for defective construction of townhomes. Successfully defended real estate broker against claims of concealment and misrepresentation; decision affirmed on appeal. Obtained summary judgment for real estate broker against claims of concealment and misrepresentation; decision affirmed on appeal.